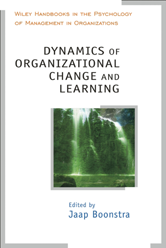 This handbook focuses on the complex processes and problems of organizational change and relates current knowledge of individual and group psychology to the understanding of the dynamics of change. Complementary and competing insights are presented as overviews of theory and research. Offers helpful insights about choosing models and methods in specific situations. Chapters by international authors of the highest quality.